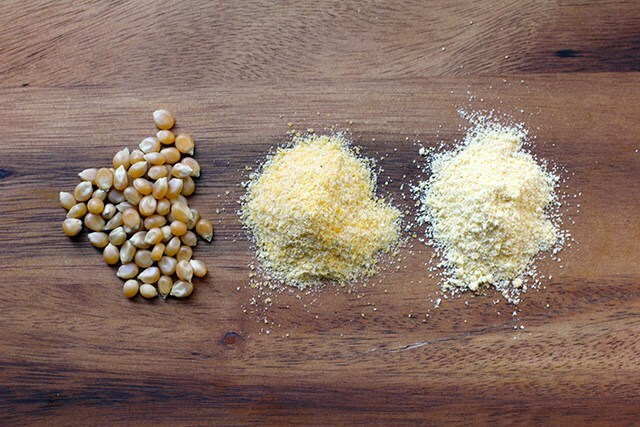 Confused about the difference between cornmeal vs cornstarch vs corn flour? Is cornstarch the same as corn flour? Well you’re not alone! They are all derived from corn and unfortunately depending on where you are from in the world some of them may have different meanings. All of them however are derived not from the regular sweet corn that most people are familiar with. They are in fact made from what is known as dent corn. Dent corn has a higher soft starch content than the ordinary sweet corn that you would find in a can or eaten on the cob. Because of this higher starch ratio it makes for a pretty good flour like ingredient once it is milled. Below you will find a brief description of what each one is and what they are most commonly used for. They all differ in texture and each has a specific use in terms of physical characteristics and end result once they are cooked. Is corn meal the same as corn starch? Cornmeal as the name suggests is a coarsely ground meal made from dried corn. A “meal” in the traditional sense means a coarsely ground seed or grain. It now commonly refers to most food stuffs that are coarsely ground or milled. Cornmeal is most commonly used to make Polenta, Grits and cornbread. It is also used extensively to make Tortilla’s and other South American staples. It can be mixed with ordinary wheat flour to help beef up the texture of bread. The most common occurrence of this is in cornbread. It is the cornmeal that gives cornbread its crumbly texture and its yellowish color. In the southern states it is possible to purchase self rising cornmeal that is used in a lot of southern cooking, especially in cornbread or cornmeal muffins. Corn flour is an even finer milled or ground version of cornmeal. However, in some European countries but predominantly the United Kingdom corn flour is used to describe what is known in the United States as corn starch. This probably leads to the greatest confusion among what differences are between cornmeal, corn flour and cornstarch. Corn flour can be used as a substitute for ordinary wheat flour especially if you are a celiac. Cornstarch is extracted from the endosperm of corn. It is gluten free and contains no protein only carbohydrates. Because of it’s high starch content it is a perfect substitute for flour when a recipe requires a thickening agent especially for sauces, soups and gravies. Corn starch gives you the ability to thicken a liquid once you start to heat it up. However, be aware you should never add it to a hot liquid. To do so would result in the cornstarch becoming lumpy. You must first dissolve it in a cold liquid and then add that to the hot liquid. This cold liquid is known as cornstarch slurry. If you can’t get your hands on it there are a number of cornstarch substitutes available such as arrowroot, tapioca or potato starch. So there you have the difference between cornmeal , cornstarch and corn flour. If you are in the US it s pretty straight forward. The cornmeal/corn flour describe exactly what they are. The cornstarch you can just think of as a starch extracted from the corn, which is still quite straight forward. If you are in the UK however you need to be aware that corn flour means cornstarch and getting them mixed up when a recipe relies on the US definition of corn flour could result in one very bad cake or bread!